Revolax dermal filler are made of pure cross linked Hyaluronic Acid without any animal products. Revolax dermal filler uses only hyaluronic acid with the highest purity through bio fermentation, it adds volumes to facial tissue, improving wrinkles and folds and restoring a smooth apperances to the face. Revolax dermal filler use BDDE as a cross linking agent, the unique cross linking technology that does not need free hyaluronic acid to adjust the physical property of its gel formula. Revolax dermal filler received its medical device CE certification, the number is 0476, it is widely used in Europe. Revolax can be dissolved with Hyaluronidase. REVOLAX’s is comprised of a regular and dense monophasic structure, which makes the gel product stable and consistent. The consistency of the pattern allows for naturally harmonized volume, smooth injection and promotes a stronger support system within the skins structure. REVOLAX dermal filler has a low percentage of product migration, meaning that once injected the product is more likely to stay close to the injection site with accuracy. Revolax product lines came with the hardest as Revolax Sub Q, medium as Revolax Deep, soft as Revolax Fine. REVOLAX SUB-Q with Lidocaine is biodegradable, non animal based, crosslinked dermal filler for subcutaneous implantation. wrinkles including nasolabials and face (cheek, chin, lip, or nose) contours. 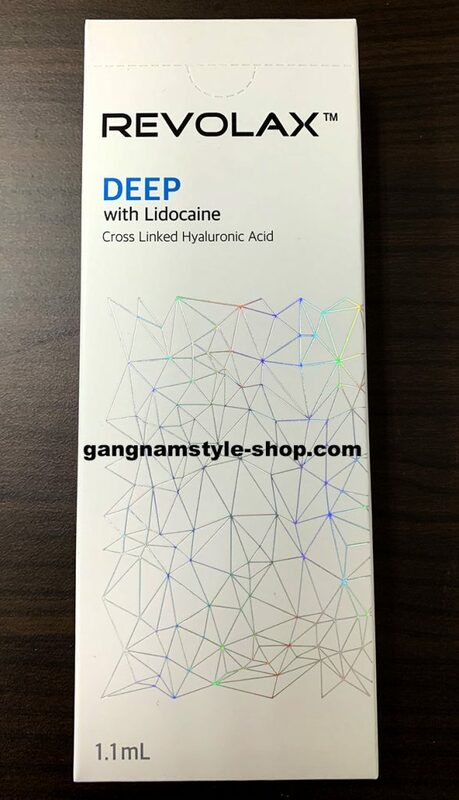 REVOLAX Deep with Lidocaine is biodegradable, non animal based, crystal clear crossliked dermal filler which has high viscoelasticity. augmentation of cheeks, chin, and lips. This mono-phasic HA filler is to be injected in deep dermis or subcutaneous tissue. REVOLAX Fine with Lidocaine is biodegradable, non animal based, crosslinked dermal filler for treatment of superficial lines. Including crow’s feet, glabellar lines, or neck wrinkles. This entry was posted in Revolax, Revolax dermal fillers and tagged Revolax, Revolax dermal fillers.